These are my Fair entries this year. No hopes for winning - jsut glad to get the free ticket - and watch my family hunt for my entries! 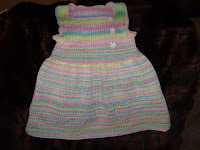 This is Kaia's dress. Cotton - and I dont really like knitting with cotton. The finishing of this is not up to my own standards! Note the buttons off to the side - to cover a hole on the neck crochet edging - since I can barely crochet! This camera does not capture colors well. These colors are dark and drab not light and bright! The yarn did not knit up as nicely as I hoped. 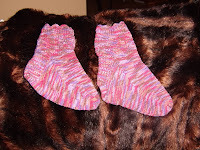 It is a stretchy yarn, so yes, those socks do fit me and they are actually the same size! I liked the yarn in the ball much better than knitted. I do not think I will be using this yarn again! I cannot tie a decent bow to save my life! Took me 3 tries to find a ribbon that is just "okay". 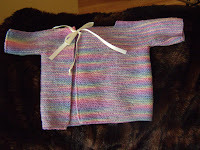 Am not thrilled with this - the pattern was not well written - and the sizing seems off. If DD#1 has a boy, as she probably will, I will gladly rip this out and make a pair of socks for myself with this yarn!